Royal Caribbean is testing out a new limited quantity VIP guest experience on select Liberty of the Seas and Oasis of the Seas sailings. Royal Caribbean is calling this pilot program, The Key, it provides guests with special benefits and perks during their cruise. The Key is being tested out on Liberty of the Seas and Oasis of the Seas for sailings beginning November 25, 2018 through the end of March 2019. The Key will be available only in the Cruise Planner for purchase at a rate of $24.99 per person, per day. All guests in a stateroom age 6 and up must purchase in order to receive benefits. Once purchased, the Key benefits are utilized via the SeaPass card and a summary of benefits will be available in their stateroom on boarding day. 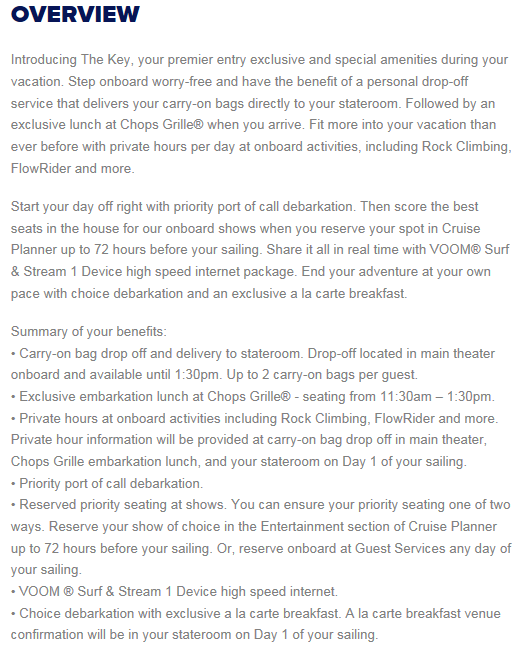 With The Key, guests can enjoy a private lunch at Chops Grille when they board, daily private hours at marquee attractions, like the FlowRider, rock climbing Wall and ice-skating rink, and access to VIP seating at shows. Please note: Guests will need to reserve their seating online at Cruise Planner before they set sail. From what we understand, this is a pilot program and whether or not it rolls out to other ships and sailings depends on how well the program is received and performs. Does this sound like something you would want to purchase? Let us know your thoughts in the comments. Video: Is Royal Caribbean's The Key worth it?